The one dollar bill you're looking at first came off the presses in 1957 in its present design. This so-called paper money is in fact a cotton and linen blend, with red and blue minute silk fibers running through it. It is actually material. We've all washed it without it falling apart. A special blend of ink is used, the contents we will never know. It is overprinted with symbols and then it is starched to make it water resistant and pressed to give it that nice crisp look. 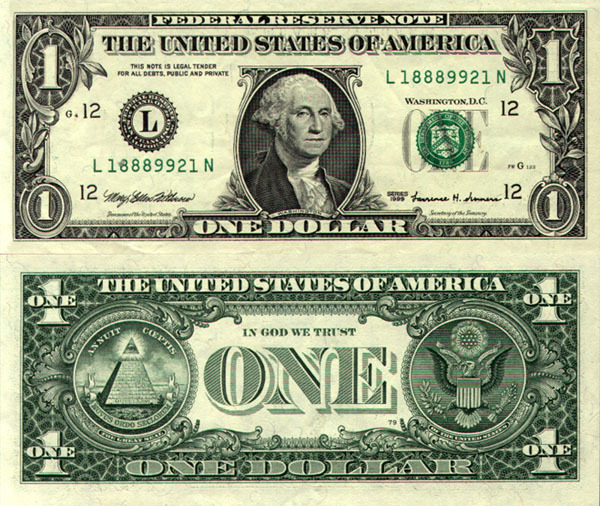 If you look on the front of the bill, you will see the United States Treasury Seal. On the top you will see the scales for the balance-a balanced budget. In the center you have a carpenter's T-square, a tool used for an even cut. Underneath is the Key to the United States Treasury. That's all pretty easy to figure out, but what is on the back of that dollar bill is something we should all know. If you turn the bill over, you will see two circles. Both circles, together, comprise the Great Seal of the United States. The First Continental Congress requested that Benjamin Franklin and a group of men come up with a Seal. It took them four years to accomplish this task and another two years to get it approved. If you look at the left hand circle, you will see a Pyramid. Notice the face is lighted and the western side is dark. This country was just beginning. We had not begun to explore the West or decided what we could do for Western Civilization. The Pyramid is un-capped, again signifying that we were not even close to being finished. Inside the capstone you have the all-seeing eye, and ancient symbol for divinity. It was Franklin's belief that one man couldn't do it alone, but a group of men, with the help of God, could do anything. "IN GOD WE TRUST" is on this currency. The Latin above the pyramid, ANNUIT COEPTIS, means "God has favored our undertaking." The Latin below the pyramid, NOVUS ORDO SECLORUM, means "a new order has begun." At the base of the pyramid is the Roman Numeral for 1776. If you look at the right-hand circle, and check it carefully, you will learn that it is on every National Cemetery in the United States. It is also on the Parade of Flags Walkway at the Bushnell, Florida National Cemetery and is the centerpiece of most hero's monuments. Slightly modified, it is the seal of the President of the United States and it is always visible whenever he speaks, yet no one knows what the symbols mean. The Bald Eagle was selected as a symbol for victory for two reasons: first, he is not afraid of a storm; he is strong and he is smart enough to soar above it. Secondly, he wears no material crown. We had just broken from the King of England. Also, notice the shield is unsupported. This country can now stand on its own. At the top of that shield you have a white bar signifying Congress, a unifying factor. We were coming together as one nation. In the Eagle's beak you will read, "E PLURIBUS UNUM", meaning "one nation from many people." Above the Eagle you have thirteen stars representing the thirteen original colonies, and any clouds of misunderstanding rolling away. Again, we were coming together as one. Notice what the Eagle holds in his talons. He holds an olive branch and arrows. This country wants peace, but we will never be afraid to fight to preserve peace. The Eagle always wants to face the olive branch, but in time of war, his gaze turns toward the arrows. 13 original colonies, 13 signers of the Declaration of Independence,13 stripes on our flag, 13 steps on the Pyramid, 13 letters in the Latin above, 13 letters in "E Pluribus Unum", 13 stars above the Eagle, 13 plumes of feathers on each span of the Eagle's wing, 13 bars on that shield, 13 leaves on the olive branch, 13 fruits, and if you look closely, 13 arrows. And for minorities: the 13th Amendment. I always ask people, "Why don't you know this?" Your children don't know this and their history teachers don't know this. Too many veterans have given up too much to ever let the meaning fade. Many veterans remember coming home to an America that didn't care. Too many veterans never came home at all.